Contemporary wallpaper designs seems to have had a bit of a resurgence of late, and for good reason. Whether you're looking to update your living room, or give your bedroom a much needed refresh, a well chosen wallpaper can make the world of difference, adding character, texture and colour. To prove that there's a wallpaper to suit every style and space, we've gathered together a selection of our favourite modern wallpaper design ideas. For all things wallpaper, go to our dedicated hub page. And, once you've made your all important choice, check out our step-by-step guide to hanging wallpaper. For instant warmth and texture within your scheme, create a natural-looking feature wall with wood effect wallpaper. Combine with knitted textiles and plenty of greenery for a cosy, inviting and somewhat Scandi feel. We especially love the Albany wood panelling wallpaper, available at Wallpaper Direct, for a similar look. A bold stripe running through a wallpaper is a visual trick that can be used to make a room feel larger. Hung vertically, it adds perceived ceiling height; widthways, it will make the room feel wider. A perfectly simple design trick for a small space. If this paper has caught your eye, find more grey wallpaper ideas in our design guide. The tranquil tones of blues and greens are perfect for a bedroom. Up the depths of the colours' tones with watercolour mural like this and create a sophisticated space with a generous helping of Zen. Made to measure, this Abstract Turquoise Watercolour mural from Wallsauce has a very millennial feel to it, particularly when paired with complementary blush pink bedding. Find more modern bedroom ideas, this time with paint. If you’re blessed with high ceilings and good natural light, a strong, floor to ceiling pattern is certainly doable. In smaller rooms, papering up to a dado rail and painting above it makes for a safer, space-enhancing alternative. When choosing a complementary paint colour, make sure it draws out the paper’s more subtle tones; light blue would be a good option here. Our guide to how to choose the perfect paint colours for every room in your home is a handy read if you're not sure where to start. Inspired by mosaic tile work characteristic in Moroccan architecture, the Zellige Collection is from Cole & Son. If your taste in wallpaper is a little more subtle, it’s worth considering something neutral toned with an intricate repeat pattern. It’s a step up from painted walls, adding a little more depth and interest to a room’s finish, but is a great option if your personal style is more minimalist. We love this Gold Spot Wallpaper from John Lewis. Find more white wallpaper design ideas, too. Equally as suited to a child's bedroom as it would be in a country-style kitchen, a vintage-style floral wallpaper makes an inviting addition to a home, irrespective of whether your interiors style is traditional or more contemporary. This Lisa Wallpaper from Sandberg, available at Wallpaper Direct, has enduring appeal. Couple with the bold lines of an industrial inspired bed, like this one from Julian Bowen Papplewick, for a more traditional feel. Browse more of our beautiful botanical wallpaper ideas for more floral wallpaper design inspiration. Obsessed with the Mid-century modern interiors style? Choose a wallpaper – and colour scheme – that could date from the era to achieve your desired look. This Aranami (meaning raging waves) paper from Farrow & Ball is a great alternative to florals and is inspired by a Japanese crafted paper-cut design. The use of a flowing pattern also means that it had both a masculine and feminine feel to it that's perfect for a Mid-century inspired scheme. If you like this idea, browse more of our Mid-century modern decor ideas. Maximalism is all about clashing patterns and your bedroom is the best place to start. Combine a bold wallpaper with a printed duvet, rug, blinds or curtains for a scheme that really stands out from the crowd. Find this Palm leaf green wallpaper at Graham & Brown, then browse more of our maximalism design ideas. For this Tropical butterfly reversible duvet set and Pineapple lamp, see George Home. Kids' bedrooms should be fun and colourful spaces, with plenty to inspire their young minds. Grab their attention with colourful bedding and a bold wall mural that can be replaced easily as their tastes change. Try Graham & Brown and Surfaceview for a range of designs. There's plenty more inspiration over in our clever kids' room design ideas, too. Looking to create a calm scheme with wallpaper? Choosing a design that creates a subtle tonal contrast rather than a stand-out clash will help make a busy room feel more laid-back. The intricate floral design running through this Helleborous wallpaper from Farrow & Ball helps to soften its bold yellow tones. Its organic pattern is intended to hint at growth and rejuvenation, transforming the home into a warm and wonderful retreat. Further enhance this feel with wooden furniture. Pair over-sized tropical wallpaper patterns with an otherwise white scheme and the simple silhouettes of Scandi-inspired furniture to create an eclectic, on-trend look that's bright and inspiring. 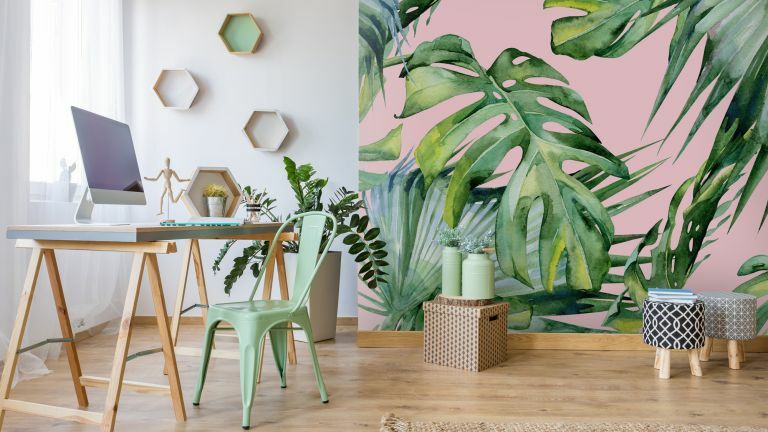 This Pink Jungle Wallpaper from Wallsauce is a great way of incorporating tropical trends into your home. Looking to give your walls a panelled effect? Save yourself time and money by opting for a cheat: a photo realistic wallpaper. Incredibly convincing, this NLXL Scrapwood wallpaper from The Longest Stay is the perfect option if your style is more industrial-inspired. Its white and brown scrapwood design has the ability to transform any space, making it a top choice for those seeking a rustic feel that looks authentic. Combining paint and wallpaper can be an effective way of giving a room a new lease of life. Opting for paintwork of a similar hue to your wallpaper can be a great way of ensuring that a bold print fits within a space. This Camellia wallpaper is paired with Smalt Paint, both from Little Greene, for a modern floral feel. High ceilings and ample natural light prevent this bold patterned paper from overwhelming the space. One of the perks of wallpaper is the ease with which it can be changed to suit evolving trends and tastes; particularly when used to form a feature wall in an otherwise neutral scheme. Terrazzo and pastel shades are two big interiors trends for this year, making this Big Pink Terrazzo Wall Mural from Pixel a great option for a space with a contemporary feel. Pair with accessories in a similar hue for a cohesive finish – cushion covers are an affordable option which can also be changed out in accordance with trends. Browse more of the top interior design trends for the coming year if you'd like this to influence your choice of wallpaper.